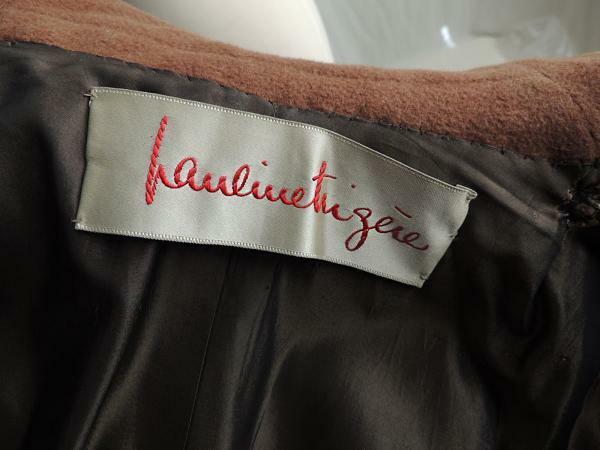 Born in Paris in 1908 to Russian-Jewish Émigrés, Pauline Trigère grew up behind the shop where her mother and father, former tailors of military uniforms for the Russian aristocracy, worked in the clothing trade. By age ten she was helping her mother with dressmaking tasks. Trigère was apprenticed at age fifteen to the couture house Martial et Armand on the place Vendôme, where she quickly showed her aptitude for tailoring and a mastery of the bias cut. In 1929 she married Lazar Radley, a Russian immigrant tailor; the couple had two sons. In 1935 she opened a small wholesale business specializing in tailored suits and dresses. Concerned about the Nazi threat, the Radleys left Paris in 1937, stopping in New York on their way to Chile. At the urging of the designer Adele Simpson, Trigère decided to stay in New York, and was hired first by Ben Gershel, then as Travis Banton's assistant by Hattie Carengie. In 1941 the Radleys opened a tailoring business with her brother, Robert, that closed when Lazar Radley left his wife and sons. In January 1942 Pauline and Robert opened another business with a collection of eleven pieces. Robert sold them from a suitcase across the country, receiving orders from many important retail stores. In order to buy fabrics for that first New York collection, Pauline borrowed $1500 and sold some diamond jewelry for $800. Within three years her name was widely known. During nearly sixty years in business, she garnered many honors: three Coty Awards, inclusion in the Coty Hall of Fame, the Neiman Marcus and Filene's awards, the City of Paris silver and vermeil medals, and the French Legion of Honor. In addition, she was inducted into the Hall of Fame of the Shannon Rodgers and Jerry Silverman School of Fashion Design and Merchandising at Kent State University (1990); was given a retrospective fashion show to honor her fifty years in business at the Fashion Institute of Technology in New York (1992); received the Council of Fashion Designers of America's Lifetime Achievement Award (1993); and had a retrospective exhibition (1994) at the Kent State University Museum, the repository of several of her earliest garments and sketchbooks that chronicle each of her collections. Also in 1994 she closed her ready-to-wear business and formed a new company, P. T. Concepts, to market her scarves, jewelry, and other accessories. She died in 2002. Trigère provided her own witty commentary during her fashion shows. She did not design by sketching, but rather cut and draped fabric directly on a model. The finished garment was later sketched as a record. She was noted especially for her elegant tailoring, innovative cut, frequent use of the bias, and sensitivity to fabric, line, and movement. Fur-trimmed evening dresses became a signature look. She was also the first major designer to use an African American model. Known as an intellectual "designer's designer," Trigère shaped her career as surely as she shaped her creations: with a strong sense of personal style. "Fashion is what people tell you to wear" she said (Epstein, p. 19). "Style is what comes from your own inner thing" (Nemy, p. C14). See also Fashion Designer; Russia: History of Dress; Tailoring. Epstein, Eleni Sakes. "Trigère." In American Fashion: The Life and Lines of Adrian, Mainbocher, McCardell, Norell, and Trigère. Edited by Sarah Tomerlin Lee. New York: Quad-rangle/New York Times Book Company, 1975. Nemy, Enid. "Pauline Trigère, 93, Exemplar of American Style, Dies." New York Times (15 February 2002): C14.